“”Exotic” won second in Show at this years Austin Pastel Society Annual Exhibition. Judge was Master Pastelist Jen Evenhus. Two fleur-de-lis paintings will be on view through July 15, 2018, at Featherstone Center for the Arts in Martha’s Vineyard. Opening reception for “The Color Purple” exhibition will be Sunday, June 23, 4-6 pm. 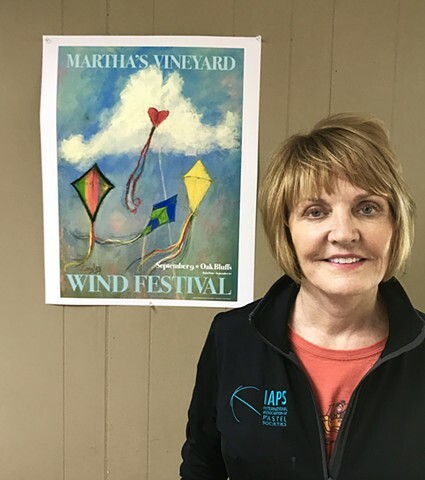 The 2017 Martha’s Vineyard Wind Festival poster this year featured the art work of Island artist Janis Langley. The poster was sold at the Old Sculpin Gallery in Edgartown and Craftworks in Oak Bluffs, and sold out on site at the festival. Langley donated all proceeds to the Martha’s Vineyard Art Association. This painting of the head vaquero on the Glass ranch in Big Spring won the Merit Award for Portraiture at the August 2016 Annual Exhibition of the Central Texas Pastel Society. 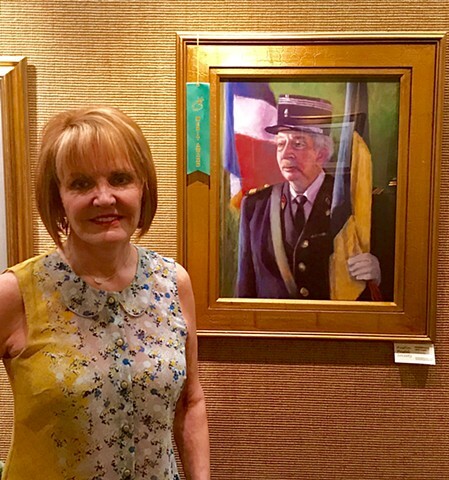 Janis Langley's portrait of a French soldier on Remembrance Day won a Merit Award at the 2017 Austin Pastel Society Exhibition in Austin. It is one of 50 paintings juried into the competition by master pastellist Stephanie Birdsall. The award was presented at the artists' reception at the Corridor of Art. In June, it was juried into the 2017 Pastel Painters Society of Cape Cod Exhibition in South Yarmouth, MA. This new work depicting a Paris street artist won 1st place in Portraits at the 2014 Austin Pastel Society's Exhibition. The show.ran March-April in the Corridor of Art in Austin. The judge was noted portrait artist Clayton Beck. In honor of her 16 years of service to the Chilmark Library as Trustee, Jane Slater was honored in June 2013 with a portrait at the reception in her honor. Artist Janis Langley painted the work showing Jane at her Menemsha antique shop, surrounded by numerous bric-a-brac and memorabilia. In March 2013, "Texas Dalls" won its second area prize for work in pastel on animal and wildlife subjects. . It took home 2nd place in that category the Austin Pastel Society's 14th Exhibition at the Corridor of Art in Austin. Janis Langley is one of three artists showing at this Austin landmark, across the street from the state capitol. Her work, "Here's Looking at You, Kid," features faces and figures in pastel. The show, at 1006 Congress, will be open through March 6, 2013. Parking for the gallery is located behind the historic building. The November 2012 exhibit at the Old Bakery and Emporium Art Gallery in Austin will include a work by Janis Langley. She is one of 16 local artists to be featured at this month-long show at this national historic site across from the Texas State Capitol. The artists' reception is from 6 to 8 p.m. on November 15 and the show will run through December 6. Janis Langley ended a successful summer season at the Old Sculpin Gallery in Edgartown, MA. Her "Chappy Ferry" painting was published in the "Chappy Ferry Book," which was launched at Old Sculpin in July and featured at numerous bookstores and retail sites islandwide. She also had an open house for her new studio in Oak Bluffs and was one of four artists featured in a two week show at Old Sculpin over Labor Day. Numerous works sold throughout the season. 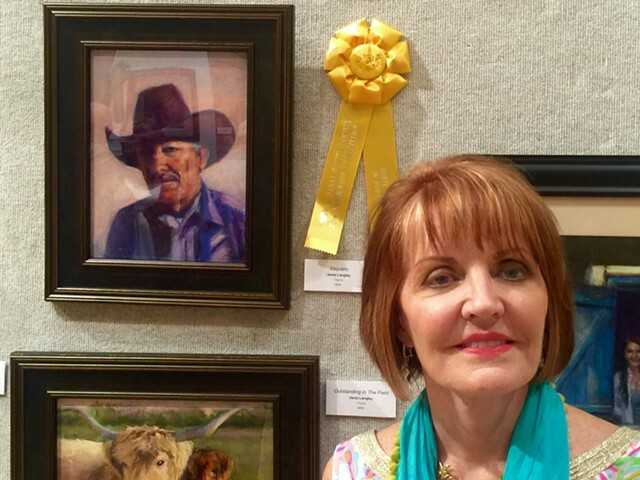 Langley's "Texas Dalls," the painting on the website home page, won the top award in the animal and wildlife category on Aug. 17 at the 11th Annual Central Texas Pastel Society's Exhibition. More than 70 paintings were submitted by area pastel artists for showing through mid-October at the Temple Cultural Activities Center. The judge was acclaimed landscape artist Bob Rohm. See the Animal/Wildlife category to view/purchase on this web site. 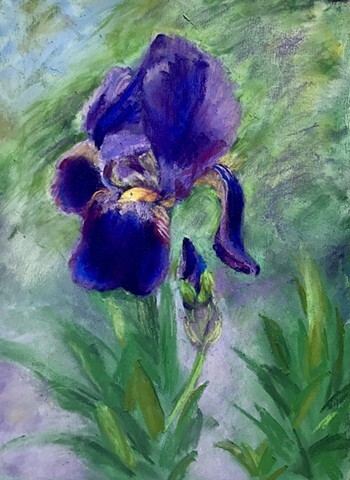 Four paintings are part of the annual exhibit of the Central Texas Pastel Society, opening this Friday, August 17 at an artists' reception from 7 to 9 p.m. Join Janis and fellow artists at the Cultural Activities Center in Temple, TX, 3011 North Third Street for the reception, or visit the CAC anytime through October 12. July 1 marked the official publication and book signing for "The Chappy Ferry Book" on Martha's Vineyard at the Old Sculpin Gallery. Janis Langley's painting of the Chappy Ferry is included in the book by Islanders Tom Dunlop and noted photographer Allison Shaw. The painting is now part of the two-week exhibit at the gallery and is available for purchase on this web site. See "Gallery/Landscapes." The studio was just completed in May and is showcasing new works of Vineyard art, including florals from last year's and this year's Vineyard garden. The new studio, located at 6 Tia Anna Lane, Oak Bluffs, MA 02557, will be open again by appointment in late August. Contact janislangley@austin.rr.com. Janis Langley's selected works are being shown now at the Old Sculpin Gallery in Edgartown, Massachusetts, whose season opened Memorial Day Weekend 2012. The works shown are part of her "Jaws Jumpers" series, also depicted on this site. 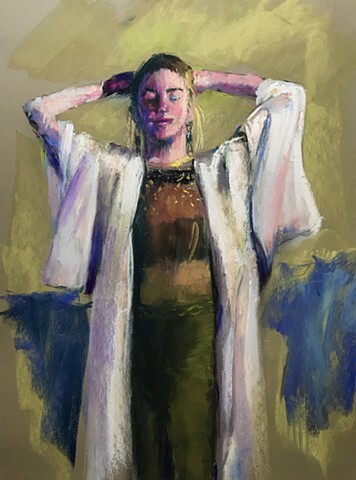 She will be teaching classes in portraiture and still life to adults and children in June and July at Old Sculpin; check their schedule for dates and times. In addition, she will be holding an opening of her new studio in Oak Bluffs, MA in late June/early July, dates and time to follow.